Optimize the computer desk set up in your home, office, or business with ergonomic workstation accessories. Sitting on an ergonomic office chair or utilizing a sit to stand desk is only the first step towards a healthy and comfortable workplace. Enhance your comfort with ergonomic office accessories including standing desk mats, footrests for desk, monitors arms, and laptop risers. Pair your ergonomic office chair with a desk foot rest to maintain the optimal spinal curvature and posture, and prevent back pain. Laptop holders for desk and monitor arms can be used to position your computer screen at eye level. This prevents neck pain by ensuring that you are not straining your neck by hunching over your screen. Using an anti-fatigue floor mat with your sit to stand desk helps you maintain a comfortable stance, so you can alternate between sitting and standing more frequently throughout the work day. 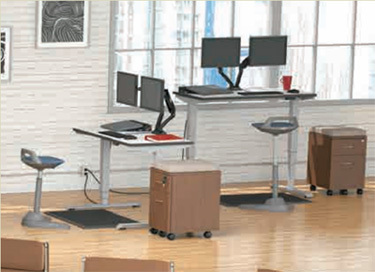 Browse all the ergonomic office and computer accessories below, and enjoy working in a more comfortable and healthy workplace today!